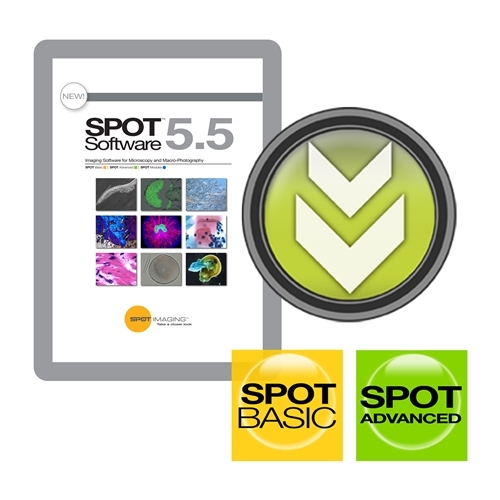 The SPOT 5.5 Advanced software is a comprehensive toolkit for SPOT camera owners who need precision control over their hardware. Image captures can be triggered externally for accurate timing with peripherals. Measurements, reticles, scale bars, and other annotations are available to enhance your image. Images can also be archived into a customizable database, dropped into the SPOT report generator for printing, or saved in several different file formats for journal submission. Repetitive tasks can be simplified with macros, user-defined taskbars and custom dialogs for commonly used functions. Microscopists capturing fluorescence images can merge and palettize images to easily differentiate fluorophores. All user preferences and settings can be permanently saved with password-protected user logins. Modules for peripheral device control, quantitative imaging, extended depth of focus and live image overlays can be added to the SPOT 5.4 Advanced Software to support specialized functions if needed for your application. The modules can be purchased separately so they can be added as your needs evolve. For computer operating system compatibility, please visit our website. This purchase also includes an upgrade to the SPOT 5.5 Basic Software. SPOT55AE is an upgrade to the SPOT 5.5 Software for customers who are running an older version of SPOT Advanced Software with a SPOT Advanced software key/dongle. If you don't already have a SPOT Advanced Software key/dongle, please order catalog number WSN-SPOT55A instead. To purchase the SPOT 5.5 Advanced Software Upgrade, in the spaces below, enter your existing SPOT Advanced Software License ID and the email address of the person who should receive the license update. Your SPOT Advanced Software License ID can be found in the SPOT Advanced Software by choosing Help/About SPOT on Windows or SPOT/About SPOT on Mac Computers. Please allow 3-5 business days to process your order. Supports all SPOT camera models except PCI and PCIe card connected cameras, as well as FireWire connected camera models on Windows 10, due to updates by Microsoft.